The pectoralis major muscle is a large powerful muscle at the front of the chest. It is used to rotate the arm inwards. Its weak point is where the tendon attaches to the arm bone, and a strain or rupture can happen here when it is put under stress when weight training for example. Symptoms of this shoulder injury include pain and swelling at the front of the shoulder. Symptoms of a pec major sprain will include a sudden sharp pain at the front of the upper arm near the shoulder where the pec major tendon attaches. There is likely to be rapid swelling of the front of the shoulder and upper arm. Tests which will reproduce pain and help confirm the diagnosis include getting the patient to pull their arm across the front of the chest or rotate it inwards against resistance. A visible gap or lump in the muscle may appear. 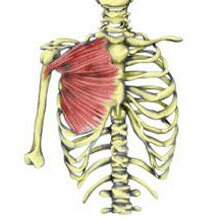 The pectoralis major muscle is a large powerful muscle at the front of the chest. It used to rotate the arm inwards, pull a horizontal arm across the body, pull the arm from above the head down and pull the arm from the side upwards. It is most likely to rupture at the point where it inserts into the arm (humerus). It is more common in weight training, especially when performing a bench press. Apply R.I.C.E. (rest, ice, compression, elevation) at least for the first two days. Ice can be applied for 10 to 15 minutes every hour initially decreasing as symptoms reduce. See a sports injury specialist or doctor. A surgeon will operate if it is a total rupture of the tendon. A long rest period followed by a full rehab program is essential. Sports massage can be applied to aid healing after the acute stage.